Does anyone know a source where I could get a handy assorted kit of small hardware to be used on projects? Im thinking things such as small nuts and bolts and stand offs for circuit boards and general hardware to be used when making electronics projects. I know there are some websites dedicated to selling such hardware but I don't have any specific need at the moment and would like to know a source of an assorted kit. Would like to also know a source for a nice complete kit of alignment tools. I used to have a nice one that I eventually lost which had most of the tools I needed but didn't have some of the stuff needed for aligning the transformers in certain sets such as CB radios. The Chinese offer kits of M3 and other metric sized hardware cheap. For SAE stuff, I have all I need, and may take some of the excess and offer it here via the classifieds. 2-56, 4-40, 6-32 stuff, mostly. I have a bunch of fillister head screws I'll also never use. 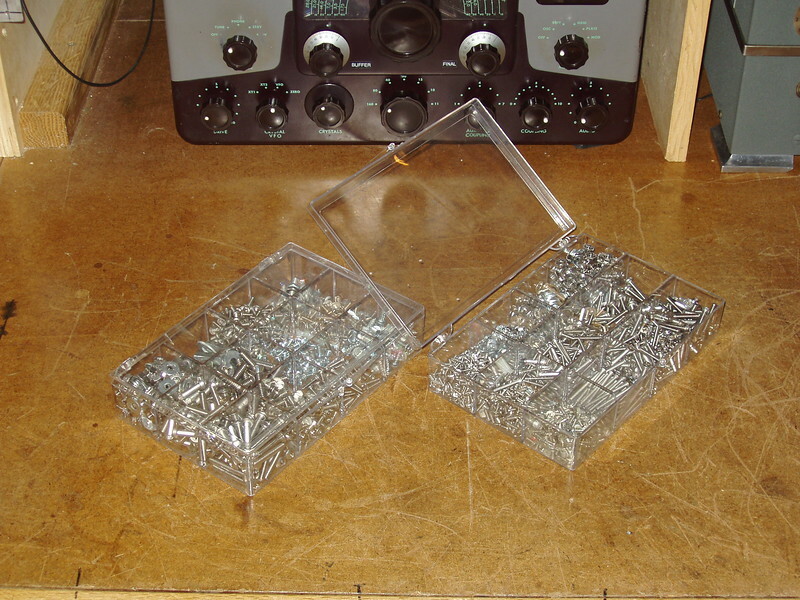 Some guitar shops sell machine and sheet metal screw sets for guitar techs. That's a nice tool, but not at $50. You could make one using a pill or relish jar. For hardware-- Ace is the place. I have heard rtlfateners.com is good for assortments of hardware. I have picked up lots of hardware off ebay real cheap. Hmmm, that alibaba stuff looks perfect. Any idea what the actual shipping time is? I'm gonna have them relayed from someone in the states and they have to be there by the end of march. For "Tweekers" I recommend you GO HERE, to the General Cement web site. They have been making tuning tools for at least 70 years or better. They have several assortments, at reasonable prices. I've used them since my days in the TV shops of the 50s. I've gotten my hardware from the halls of Ebay. There are quite a number of hardware vendors selling pretty cheaply. I purchase screws, nuts, Keps nuts, and washers in lots of 100s for not much money. It will serve you well to go to the local hardware or big box and ask about 100ct boxes of what you want, for comparison. Screws I order in 1" lengths, and I also have a pair of Klien wire cutters, strippers, and screw cutters to cut them to whatever length I need. I've had these for probably 8 to ten years and they are still sharp. This keeps inventory down by only having one length of each diameter. Stainless Binder head, CS, either 82* or 100*. That's it. Spacers, be they threaded or hollow, are a different story in that typically you have to buy a specific length/size. I buy retail if I must, but at ham fests, I always keep my eye open, and often ask about spacers, or anything else I'm looking for. You would be surprised how often people didn't bring things, but are glad for the opportunity move that kind of stuff on. Another source is your auto parts store, where you can buy 3 and 4 foot lengths of ridgid brake line (tubing) in a few different diameters, and you just cut to your desired length. Last edited by Mikeinkcmo on Mar Wed 07, 2018 5:44 am, edited 3 times in total. Keep an eye on ebay. Full size kits come up every now and then. I just have to tease Mike a little bit. He reminds me of those product makers who can't have a photo of the product without a pretty girl in the background to catch your eye. For Mike, its that nice Johnson Ranger he has. He has snuck it into two different threads unrelated to ham gear now. I have to admit, it is pretty and eye-catching. Mike, you should post about your update mods on the Communication Receivers and Transmitters section of the Forum. You put in a lot of very nice work and others might want to take advantage of your engineering. I picked up a boatload of hardware for cheap by keeping an eye on what Fastenal had on clearance. Thanks for the great suggestions guys! I only have two horizontal surfaces in the whole place, and both are usually covered with junk. I have to pick the least cluttered spot, bulldoze all the stuff thats there, down toward the "other end" so I have a place big enough to set up the pic. Besides, something in the pic needs to be interesting. Besides, something in the pic needs to be interesting. Amen - I love looking for easter eggs/other items in the pics. I found a common friend that way once - his aunt was my neighbor - her picture was in the listing for an eBay auction I was bidding on. "Crop not, my fellow cake-eaters......"
Just to show you hypocrisy is humorous... here's one of my three flat surfaces.... in its usual state... note the Ranger in the background! Along with what appears to be a 129X? Mike, you are quite correct. A few years back I was bitten by the nostalgia bug and decided to try to re-create my novice station from 1962. Not able to find the exact same serial numbered gear of course, but that's what my station consisted of..... Johnson Ranger transmitter and Hammarlund HQ-129-X receiver. I also had a Heathkit QF-1 Q multiplier, which was handy on the novice bands back then. I have another but it is sitting in a closet and not interfaced with the receiver at this time. The Collins S-line is behind the camera and not visible in the photo. In regards to the knob pullers. I just found out that if I wrap some duct tape tightly around plastic knobs it can pull them straight out. Might not work on all. Was working on a modern day stereo and the little knob to the volume encoder was a bit too narrow for me to get a proper grip. Tried using gloves then tried the duct tape trick and it worked great.